Air filters are devices that use fibrous materials to remove solid contaminates from the air, such as mold, pollen, bacteria, and dust. 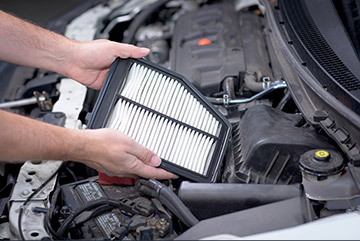 Vehicles use two different types of air filters: automotive cabin air filters and internal combustion air filters. The cabin air filter clears pollen, dust, and other contaminates from the climate control airflow (includes air conditioning and heating). If working properly, the filter ensures that the air circulating throughout the car is free from harmful elements. If these filters are not replaced periodically, AC performance can be negatively affected. In extreme cases, a clogged air filter can even pose potential health risks to the driver and any passengers. It is recommended that the cabin air filter be changed every 12,000 miles or once a year, whichever comes first. The internal combustion air filter prevents contaminates from entering an engine's cylinders, which could cause extra mechanical wear or contaminate the engine's oil. If the air flowing though the engine is not adequately filtered, the effects can lead to excessive fuel consumption and low engine power; these issues can eventually lead to expensive repairs.